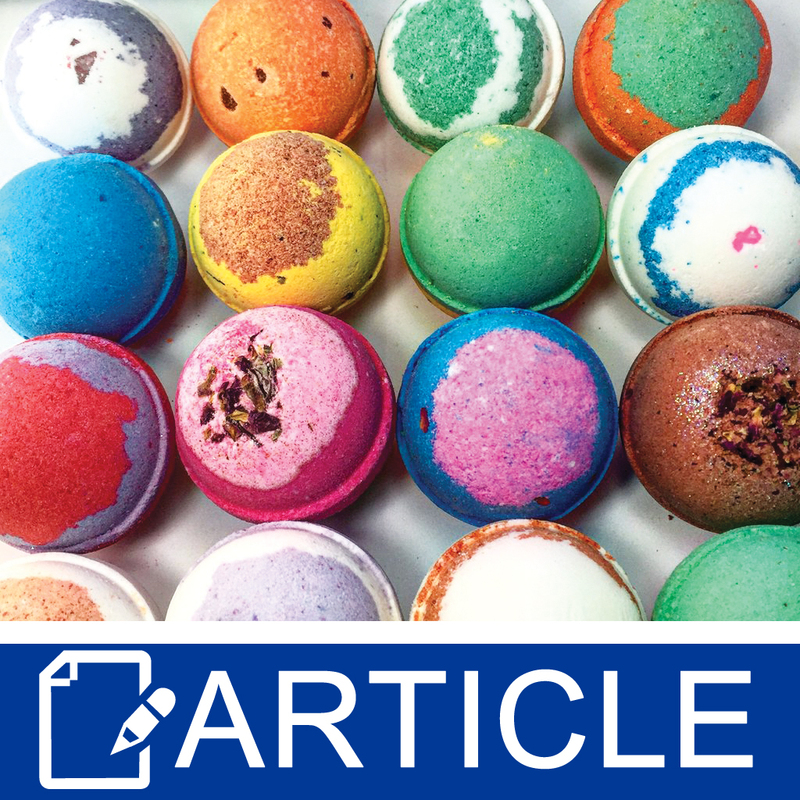 What makes the simple combination of citric acid and baking soda in a bath bomb fizz and bubble, releasing all kinds of wonderful fragrances and colors? It’s all about the chemistry, of course – in this case, an acid-base reaction. There are a few different definitions for acids, but we'll go with the Bronsted-Lowry definition that an acid is a compound that donates a proton or hydrogen ion (H+) to a base. The more readily it donates that proton, the stronger the acid. Bases accept a proton or hydrogen ion (H+) from an acid. The more readily it accepts a proton, the stronger the base. pH is a measurement of the concentration of hydrogen ions. The higher the concentration, the more acidic the ingredient, and the lower the pH. Conversely, the lower the concentration, the higher the pH, the more alkaline the ingredient. A strong acid like hydrochloric acid has a high concentration of hydrogen ions, so its pH measures near or at 1. A strong base like sodium hydroxide has very few hydrogen ions, so its pH measures near or at 14. With the exception of lye, the ingredients we use in bath and body products are weak acids, like citric acid, AHAs or salicylic acid; or weak bases, like baking soda, triethanolamine or decyl glucoside. In bath bombs we bring together a weak acid - citric acid with a pH of 3.2 – and a weak base – baking soda with a pH of 8 to 9. When we drop them into the bath, they react to release carbon dioxide (CO2) gas, which gives us the fizzing that defines the product. If our goal is to release as much CO2 gas as quickly as possible, what’s the perfect theoretical ratio of citric acid to sodium bicarbonate? Three moles of sodium bicarbonate (84 g/mol) and one mole of citric acid (192.124 g/mol*) combined in water will produce three moles of CO2 gas, three additional moles of water, and one mole of a salt, sodium citrate. This ideal equation calls for 1.312 grams of pure baking soda to 1 gram of pure citric acid for maximum fizz. As an aside, a mole is 6.02 x 1023 atoms, so a mole of citric acid weighs 192.124 grams per mole. In the real world, these ingredients are found as compounds, which may include minute amounts of chemicals like salts or extra water molecules, so we need to alter the ratio slightly to ensure a complete reaction. I’ve found 2 grams of baking soda to 1 gram of citric acid works best, but your mileage may vary. If an acid-base reaction requires water to make the magic happen, why do we encounter bath bombs fizzing while still in the mold or in storage? You can thank atmospheric water for starting the reaction too soon. The solution? Avoid ingredients that contain water, including liquid dyes or witch hazel, or use them sparingly if you live in a more humid climate. Consider using oil soluble ingredients as your binder, like oils, which add moisturizing power to the bath. Store your bath bombs in plastic wrap or in sealed containers with a few of those “do not eat” silica packages scattered about to keep them fresh. And consider using ingredients like cornstarch or salts to isolate any water to prevent a premature reaction. Does harder equal fizzier? It could. 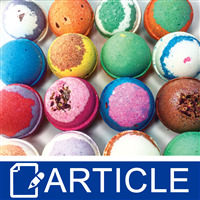 Harder bath bombs are denser than softer ones of equivalent size or diameter, containing more ingredients for the reaction in a smaller space. They’re less likely to have reacted with water while in storage. And they could contain powdered versions of ingredients like citric acid, which would pack together more tightly than granular ones. I’ve noticed a trend of using cream of tartar (tartaric acid, pH 3.5 to 5) as the acidic component. You’ll use less cream of tartar – theoretically, you need 2.24 grams of baking soda for every gram – but it’s an expensive ingredient at more than $11 per pound versus citric acid’s $4 or less. As a powder, it might allow for harder, denser fizzies, which makes it worth exploring as some or all of the acidic component. With bath bombs, for some, the Holy Grail is a large ball that spins and fizzes. If you’ll indulge me, I have a few theories about why this happens. Perhaps the inclusion of more citric acid ensures a better reaction and more production of CO2 gas. It seems lighter bath bombs that float to the top easily spin more quickly than those that take longer to rise. And it could be a warmer bath encourages a faster rate of reaction and quicker production of CO2 gas than a colder one. A practical way to create a spinning bath bomb is to embed a smaller ball at one end with a different ratio of acid to base – say 1:1 – for a quicker reaction time. Another is to make the bomb an odd shape, like a top or a rocket ship, so it will tumble over itself as the smaller end dissolves faster than the larger. Finally, consider the ingredients in your recipe. It may be nice to include oils, butters, clays or starches, but any or all of these could reduce the speed of the acid-base reaction, resulting in a less than spectacular release of CO2 gas.